Australian Banking Sector – The Bank Vault: Valuation charts -Bank sector – valuation metrics. Inside this week’s Bank Vault we highlight key bank valuation trends over the last month, and take a look at the week’s regulatory news. The major banks’ avg 12m fwd PER is currently 11.1x, which is 14% below the 5yr avg. On a relative basis, the majors on avg are trading at a ~19% discount to the 5yr avg PE rel vs All Industrials ex-Banks. WBC is trading at the largest discount to historical PE rel (21% below its 5-yr avg), while ANZ’s discount is the smallest (14%). The dispersion among the majors between the highest and lowest PERs is now at 1.2x, and remains significantly below the 5yr avg of ~2.2x. Call to action – Cybg PLC CYB has received IRB accreditation from the PRA for its Mortgage and SME/Corporate portfolios. Our underlying EPS forecasts have not changed as a result of this announcement. However, our FY19F underlying EPS is increased by 10% as we now allow for an earlier earnings contribution from Virgin Money. 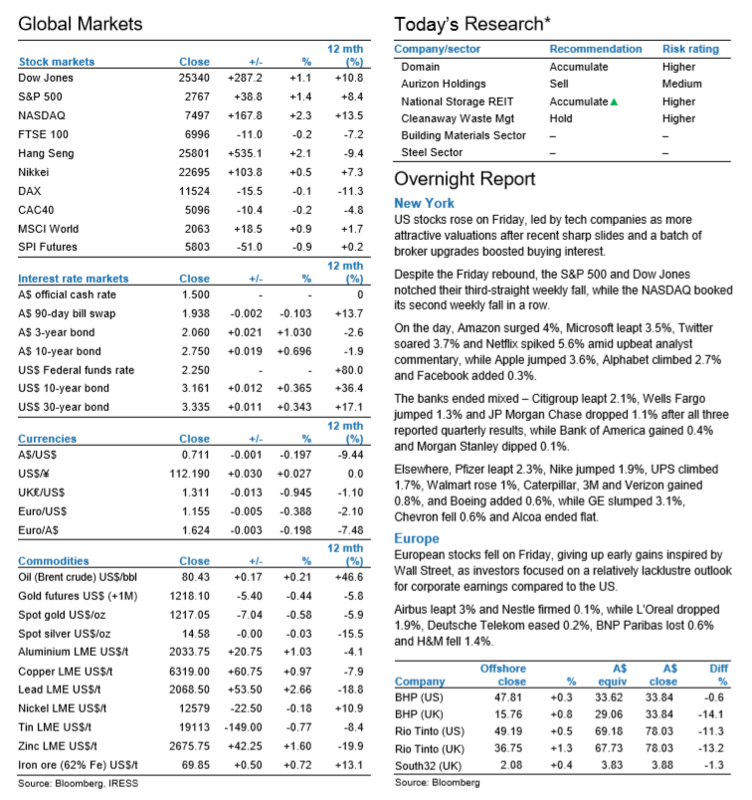 US Market: The US benchmark S&P 500 stock index snapped a six-day losing streak on Friday as technology stocks recovered after a week of losses, with investors looking for bargains ahead of the third quarter earnings reporting season. European Market: European stocks failed to stage a recovery on Friday, posting their worst week since a market correction last February as a new sell-off hit bourses across the globe, amid worries about protectionism and fast-rising US interest rates. Asian Market: The Hang Seng Index rose 2.1 per cent in Hong Kong, with Tencent Holdings posting its biggest gain since 2015 after sliding for a record 10 days. Shanghai’s benchmark reversed morning losses to close 0.9 per cent higher. REA Group (A$75.50) ADD TP A$92.02 Outlook trimmed. As a precautionary measure, we have lowered our REA forecasts following last week’s earnings warning from Domain. While REA is not immune from the drop in top-end residential listings volumes in Sydney and Melbourne that caused trouble for Domain, its business is more geographically diversified. In our view current for sale listings volumes are unsustainably low, but the timing of any return to normal volumes is difficult to call. Our valuation and price target fall to A$92.02 from A$95.21. In our view REA represents good value at current levels. We maintain an ADD recommendation. Domain Holdings Aus (A$2.77) REDUCE TP A$2.52 Caught in a downdraft. A downturn in residential ad volumes in NSW and Victoria caused Domain to downgrade market expectations for FY19, with Q1 revenue growth less than half market expectations. Domain is paying a heavy price for its over-exposure to NSW, where the drop off in ad volumes is more severe than in other states. We downgrade our profit forecasts to reflect the update. Our price target – set by our DCF valuation – drops to A$2.52 from A$2.81 per share. While listings volumes look unsustainably low, and should rebuild over time, short-term confidence in a turnaround may remain weak. We retain a REDUCE recommendation. Japara Healthcare Lt (A$1.24) HOLD TP A$1.35 Terms of reference are key. The terms of reference for the RC into aged care have now been set, with an interim report due by October 2019. We see the price range bound for 12 months. Higher wage costs, audit and compliance costs are likely across the sector and we have preemptively increased our cost by 1% across the forecast period. We have applied a discount to our valuation to reflect uncertainty around possible outcome of the RC. We retain a Hold recommendation. Michael Hill Int (A$0.91) REDUCE TP A$0.70 Trading update reveals a very weak 1Q. MHJ reported a very weak 1Q trading update, with group SSS -11% and all regions heavily negative. The performance was attributed to ‘under estimating marketing and promotional activities’. This is the softest comp sales performance we have seen from a retailer in a long time. Given MHJ is in a CEO transition phase (new CEO starts midNov), we are cautious on the viability of the current sales strategy and performance for the rest of FY19-onwards. We make material EPS downgrades (33-35%) across FY1921. Clearly MHJ’s share price will fall materially on the back of this update, and we are cognisant of not getting too negative at what could be a low point. However, the fact that all territories are so weak simultaneously is of real concern and the brand, earnings and operational uncertainty are too great for us to recommend holding the stock. We downgrade to Reduce with a revised target price of A$0.70.